BCH of Idaho member, Robbin Schindele, Emmett, Idaho, was presented the 2010 BCHA Double Diamond Award at the BCHA National Directors Meeting in Butte, Montana. His winning entry was the two trail safety posters. Both titled “What the Horse Sees”. Both posters emphasize trail safety and education to non horse riders when meeting horses on trails. 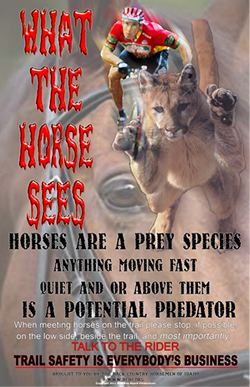 As horses see objects in terms of potential predators, the posters show how a mountain biker may appear to a horse as a cougar and a backpacker may appear as a bear. The posters educated how mountain bikers and backpacker should approach horses and riders on trails. The posters have been, and continue to be, used across the US by equestrian and non-equestrian trail user groups and public land agencies. They are available for download, Robbin’s award winning BCH bike and hiker posters “What the Horse Sees”. The BCHA Volunteer Hours Committee felt these posters would be beneficial nationally anywhere they are posted and could be posted at bike shops, sporting good stores, as well as places such as REI, North Face, horse supply stores and trail heads, places where the general public may see them. 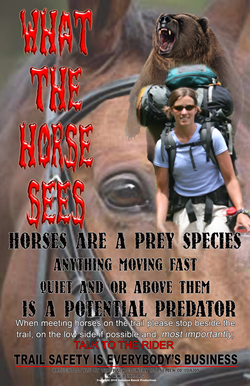 The posters are very visual and will quickly educate the public of what to do when encountering horses on the trails. You are encouraged to distribute these posters to all the agencies you volunteer with and local hiking and mountain bike groups.